Hello Leo Listeners! 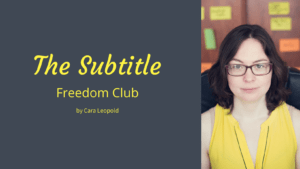 It’s Cara here from Leo-listening.com where I help advanced English learners break free from subtitles so they can fall back in love with their favourite films and series. Continuing the theme of personal development during the month of March, I realised that no discussion of personal development is complete without some mention of TED talks. In fact, TED talks have come up over the last couple of weeks as I knew they would. Last year I did a podcast about why you shouldn’t listen to TED talks and it became my most listened-to podcast episode ever! So I want to start by reiterating one of the principle points from that podcast and that is: what you listen to is not as important as what you do with it. What I mean by that is what you listen to is not the key. No resource will magically make you better at English and improve your listening. No resource will magically make you better at English and improve your listening. Some resources can make you feel better or worse. So when you listen to slow audio for learners, you feel really good because you understand everything. Then if you listen to a mumbly film or a bunch of native speakers talking fast, obviously you feel bad about yourself because you don’t understand much. But ultimately, what you do with what you listen to is the most important thing. What you listen to in English is not as important as what you do with it. You know that just listening is not enough – well I hope you do! That’s the whole point of this blog. That’s why I show up every week to remind you of the fact that just listening is not enough. If you watch TED talks and just listen, then yes, you’ll get something out of them. Yes, you’ll make some progress. But not as fast as when you do some specific activities that will actually improve your listening. 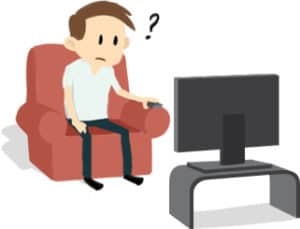 One of the advantages of TED talks and any other kind of academic listening is that they tend to be a bit slower and easier to understand than films or native speakers chatting. They’re monologues, so you only have to worry about one person speaking. It’s not an interaction. There are sometimes slides to help you understand. You’ve got the person’s hand gestures as well. They’re delivered more slowly because it’s a speech. Now, listening to TED talks then is great if you want and you need to understand conferences or presentations at work. But they’re not so great if you want to understand real people talking, or films and TV. Listening to TED talks is great if you want and need to understand conferences or presentations at work. But they’re not so great if you want to understand real people talking, or films and TV. 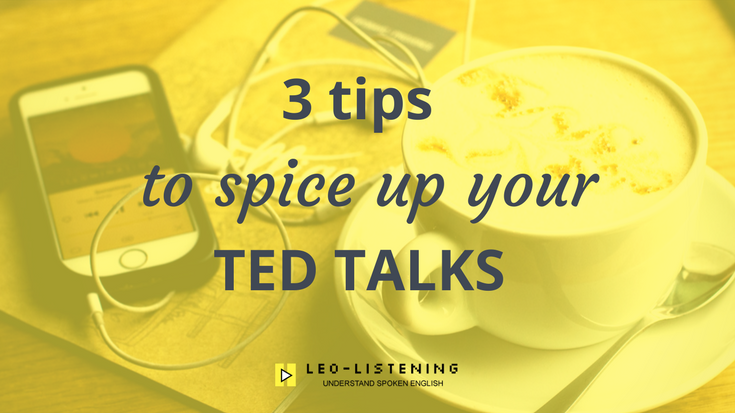 That’s why my first tip for making TED talks a bit more challenging and spicing them up is: speed up the talk! What’s a bit annoying about TED talks is that often they’re 15 to 20 minutes long. So sometimes I just read the transcript to get to the juicy information. Or another thing I do if I really want to listen to the speaker is I put the talk on and I put the speed at 1.5 speed. That means the person’s speaking 1.5 times quicker and I can get through the talk more quickly. You can adjust the speed by clicking on the little wheel thing on the video. I’ll add a screenshot so that you can see what I mean. You could also put the videos on double speed, but I find that double speed is too quick! But hey! If you want a challenge, then why not go for it? 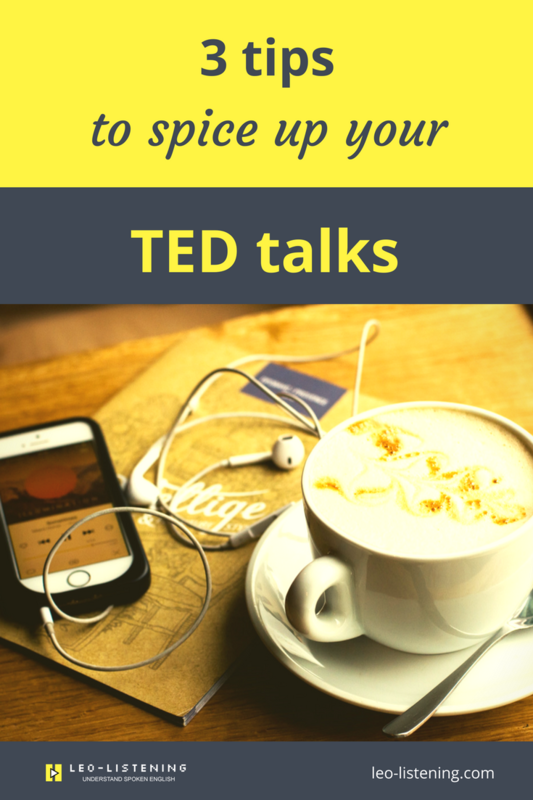 My second tip to add some spice to your TED talks is to listen to the TED podcast on NPR (National Public Radio I think!) in the US. There’s a show called the TED Radio Hour. This should be a little more challenging than just your standard TED talk because it’s an interview style podcast with the speaker from the talk with extracts from the talk. For each episode there’s also a transcript so you can read along with it. Or you can choose sections for dictation, write them out, and then check with the transcript. 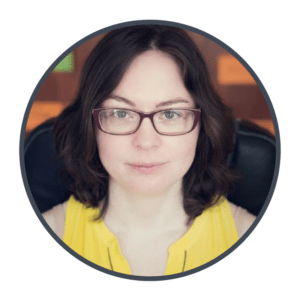 I’ve got a detailed guide on how to make the most of transcripts in a blog post called “the feel-good guide to texts and transcripts”, so check that out for some more tips. I’m also going to link to an example of a TED Radio Hour with a podcast that I listened to with a guy called Christopher McDougall. So you can try out those tips. My final idea for making your TED talks a bit trickier is using the playlist of 3-minute TED talks. Most talks are in the 15 to 20 minute range, but TED have put together lists of shorter talks and the shortest ones are 3 minutes. So what’s good about the shorter talks is you can transcribe a decent section without getting too overwhelmed. And, what’s really great about them is that they’re short enough that you can put them into an amazing tool called Tube Quizard and create some quizzes based on tricky to catch parts of English like contractions, articles, two-word chunks (combinations like “and then” for instance). If you’re going to do that, the thing with Tube Quizard is you must use a subtitled YouTube video. So you would need to go onto the TED YouTube channel and then copy and paste the link for the video that you want into Tube Quizard. I’m also going to give you the link to the TED 3 minute talks on the TED website. I’ve already created some quizzes on Tube Quizard with Matt Cutts’ talk on trying something new for 30 days, so you can go in and play around with the different listening quizzes from that talk. One final point before we finish off. A lot of people love TED talks and think they’re amazing because of the interactive transcript. But if you know where to look, you can find an interactive transcript underneath a subtitled YouTube video. If you know where to look, you can find an interactive transcript underneath a subtitled YouTube video. I made a post and a video about that a couple of years ago that I’m going to link to, because you can find videos on all kinds of topics with interactive transcripts as long as they have accurate subtitles as well. You can look at the interactive transcript with the automatic subtitles, but the English is full of errors, so there’s no point. I’ll link to that information too because it’s not only TED talks that have interactive transcripts. I hope you will try out those tips and make your TED talks a little bit more challenging for your ears! Thanks very much for reading and I’ll see you soon.